Sesame oil, toasted --- 3 Tbsp. Brown sugar --- 1 tsp. Soy sauce --- 2 Tbsp. Chipotle chiles in adobo sauce, minced --- 1 Tbsp. Skirt steak, cooked, sliced --- 8 oz. Pepitas, toasted --- 3 Tbsp. 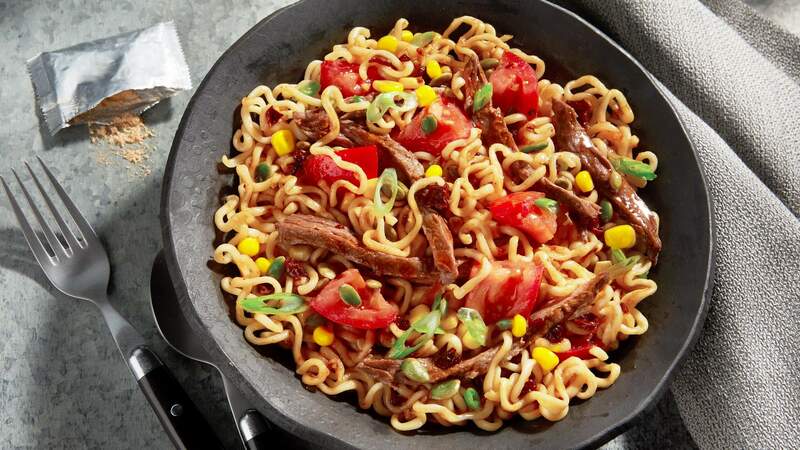 Cook noodles in a pot of boiling water until done. Drain, rinse and transfer to a large bowl. Combine sesame oil, scallions, garlic, ginger and brown sugar in a small saucepan. Heat over medium heat until starting to sizzle. Cook for 15 seconds. Remove from heat and stir in soy sauce, chipotles and TABASCO® Chipotle Sauce. Garnish with pepitas and dust over top with TABASCO® Chipotle Spray Dry.